Food Costs > How Much Does Parsley Cost? How Much Does Parsley Cost? Parsley, also known as Petroselinum crispum, is a type of plant that is widely cultivated as a herb, spice, and vegetable. It is used in Middle Eastern, European, and American cooking, most often used as a garnish. At local grocery stores, such as Walmart, farmers’ markets or food coops, a “bunch” of fresh parsley can cost anywhere from $0.50 to $2 per bunch, while dried flakes can cost $5 to $9 per pound. 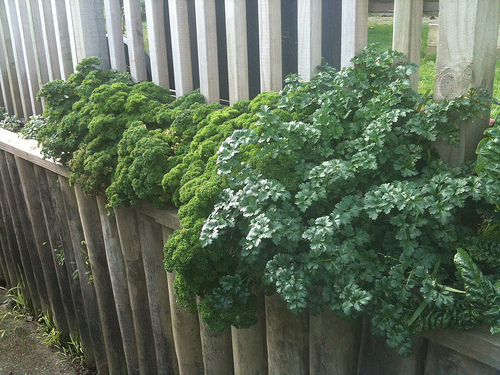 Organic parsley is often $1.50 to $2 per bunch. Parsley leaves are also manufactured as food supplements and are usually sold in 100 capsule bottles for about $4 to $6. There are two types of parsley: curly and flat-leaf (Italian). Curly leaf will be the most recognizable as most restaurants will use this as a garnish and is known for its curl, hence the name, while flat-leaf parsley will have a robust taste and will be ideal for flavoring purposes. It can also come in two forms: either dried or fresh. With dried parsley, it will take 12 pounds of fresh parsley to yield one pound of dried parsley. While some deem the dried version as being flavorless, this isn’t entirely accurate as it can add some flavor if added to a dish seconds before it’s being served. A bunch of flat leaf parsley will have more springs than curly parsley; however, when it’s chopped, the curly parsley can actually yield twice as much as Italian. Fresh parsley can last up to two weeks if left in a refrigerator, and dried parsley can last up to more than a year if stored in a dark and cooler location. At a grocery store or farmers’ market, parsley is usually bunched together with a rubber band in the produce section of the store. If you’re going to grow parsley, make sure that you grow it in a tray inside before taking it outside to a garden or even a pot. It can take up to four weeks for parsley to germinate. Even if you don’t have a tray set, consider using smaller Tupperware containers. After four weeks, you can transfer it to the garden. When growing inside or even outside, always make sure that it’s in a sunny spot. Always make sure you water at least twice a week to make sure the plant is receiving the appropriate amount of water. If using the dried variant, use only a third of the recommended amount if the recipe is calling for fresh parsley. Every pound of dried parsley will have 14.5 cups. When a recipe calls for parsley, 99 percent of the time, it’s calling for the Italian version. Store parsley by snipping the bottom of the stems off and either placing the stems in a jar with water, similar to flowers or loosely store in a plastic bag. Wash the parsley with cool water and separate the leaves from the stems. Throw the leaves in boiling water for 30 seconds. Place a brown paper on a baking sheet, place parsley across the tray and dry in the oven at the lowest setting for three to four hours. This time will depend on the humidity, but you should be able to tell when it’s ready if it crumbles in your fingers. Remove from the oven, crumble with your fingers in a bag or use a mortar to crush into tiny pieces. Place the finalized product in an airtight container. While parsley can be cheaper at the local grocery store, it doesn’t hurt to check local farmer’s markets to see what kind of selection that they have. Not only will the selection be fresh and straight from the farm, you may find that there is a difference in taste as well. Parsley isn’t actually necessary in most things, especially when used as a garnish. While it does make the appearance of your food more appealing, do not spend the money on it if you do not have to.